Living room with large fireplace, perfect for gathering. Kitchen and dining area. Dining table seats 6 and kitchen has all the essentials. Master Bedroom with king sized bed and it's own deck w/ sitting area. Bear room with queen bed & private access to deck area. Welcome to Rock View! 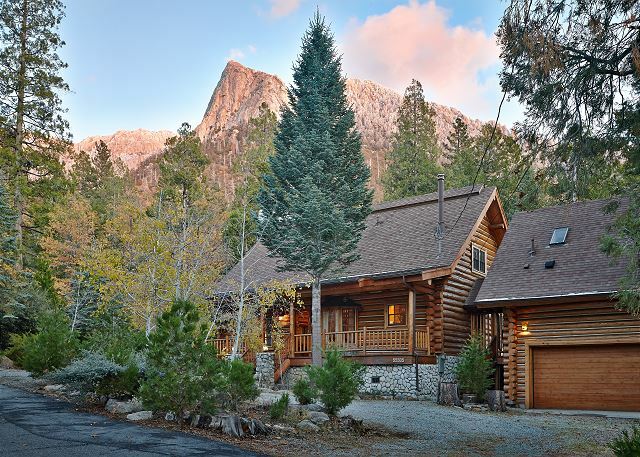 Rock View is a beautiful 3 bedroom log cabin home nestled in the trees in the serene area of Fern Valley in the small town of Idyllwild. With outstanding views of Lily & Suicide Rock, Rock View offers its guest with vaulted ceilings, lots of light and privacy. The home has three bedrooms, one being detached with it's own bathroom. The deck is the home's featured hang out spot. Out on the spacious deck there is a hot tub as well as outdoor seating and a BBQ. This home has become a favorite for large families and groups alike! Don't be shy, come and see what Rock View has to offer. Weekend rate Friday/Saturday is $375.00 p/night. Weekday rate Sunday thru Thursday is $300.00 p/night. Winter Holiday rate $550.00 p/night (Thanksgiving, Christmas and for New Year's, with a 4 night minimum). Holiday rate $425.00 p/night, a 3 day minimum may be required. Call us for our weekly/monthly specials. Pets are welcome. Pet fee $25-35 per pet/per day will apply. Linen/Prep fee $150.00. Rooms Sleeps 10, Large master bedroom on 2nd level with French doors leading to a private balcony. Small loft over looking the family room, great area for kids. 2nd room down stairs with French doors out to the large patio deck. We had an awesome stay at Rock View in November 2018. One of the highlights was that we saw multiple deer while sitting on the wonderful back deck. We also enjoyed sitting by the fireplace in the great room. This was our second time staying at Rock View. My wife and I visited the first time in April of this year for a few days. We loved it and came back in October for a full week. It's a beautiful and very comfortable cabin, and we appreciate that we're able to bring our pets with us. Thank you. Perfect getaway for the family! Relaxing and beautiful.. Above expectations. The home and Idyllwild are gems that I was never aware of in my 62 years of living in Southern California. Just what the Dr. ordered for the occasion. Relaxing, quiet mini vacation with an amazing view. Over the years, my stays with New Spirit have been wonderful. If there is an issue, it is usually fixed immediately. I have stayed at this particular property a few times and will be there at the end of July for our 25th wedding anniversary. 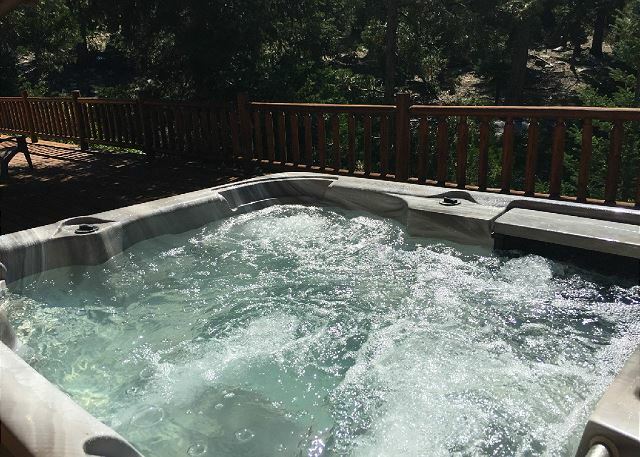 The hot tub, however, has not heated up beyond 85 degrees. Hoping it be up and running for our next visit. Wonderful quiet location. 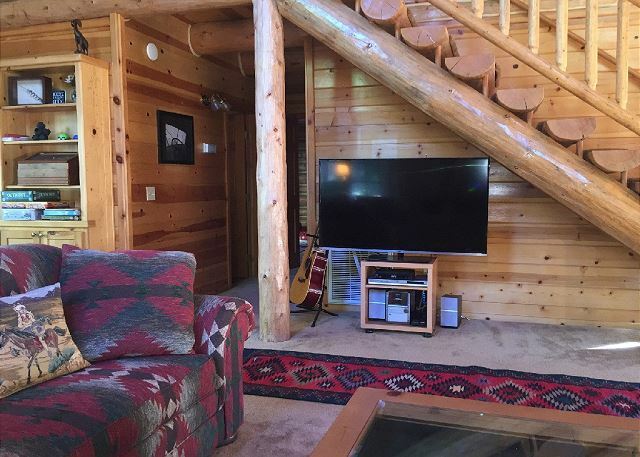 Close to town but cabin felt isolated/private. Cabin was beautiful and full of woodsy/forest decor. Had everything. Needed nothing private sleeping areas, large comfy rooms. Would stay here again and again. No need to look at any other homes. We really enjoyed our stay at this home! Everything was perfect! thanks heaps for such a lovely stay....everything was just perfect. So perfect, we never left the property the entire stay. We had a fantastic time with friends for a quick getaway in the mountains. 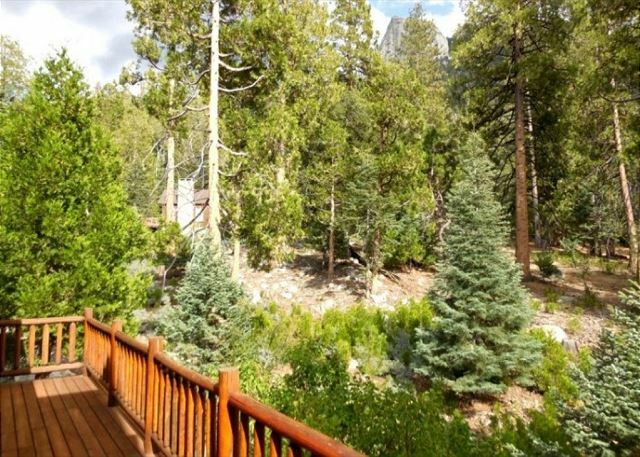 This rental is beautiful, well stocked, three private sleeping areas and a large deck to enjoy the views. Fantastic time at a beautiful property!! Enjoyed the home, support and the SNOW!! 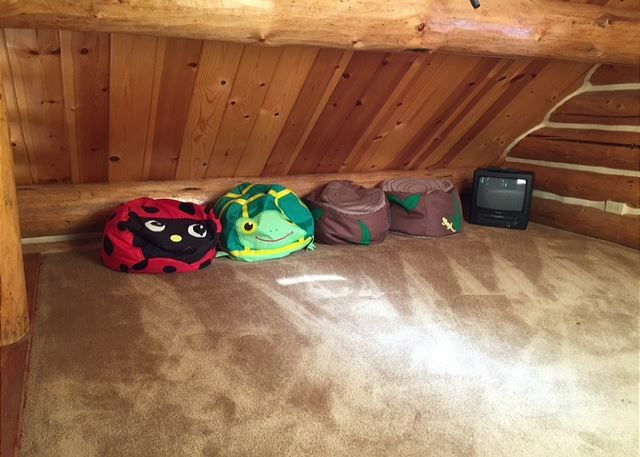 Rock View log cabin was like our dream home come true! So beautiful, we love log homes and the Master bedroom loft was like being in a tree house:). We loved being able to build a real fire in the fire place. The kitchen and dining area with the bay window was a cozy favorite. The location is perfect being close to Humber Park for hiking and also close to town! We'd love to make this an annual get a way. 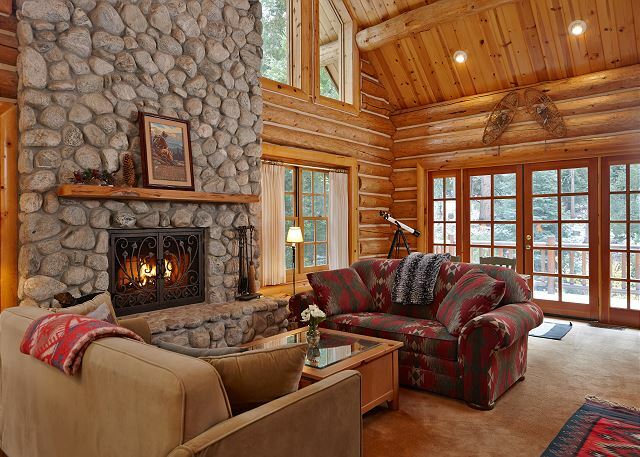 Beautiful log home nestled in a lovely wooded backdrop less than 10 minutes from town. Home was very clean with many amenities. Deer were plentiful. New Spirit staff were very nice and accommodating. Everything I have always desired in a mountain get away. Our family loved Rock View. The cabin is nicely laid out providing great social space and privacy. The views are beautiful and the setting is very tranquil. Idyllwild is a wonderful little artsy town with some pretty darn good restaurants and great hiking! Monica was very helpful and we would rent from New Spirit again! 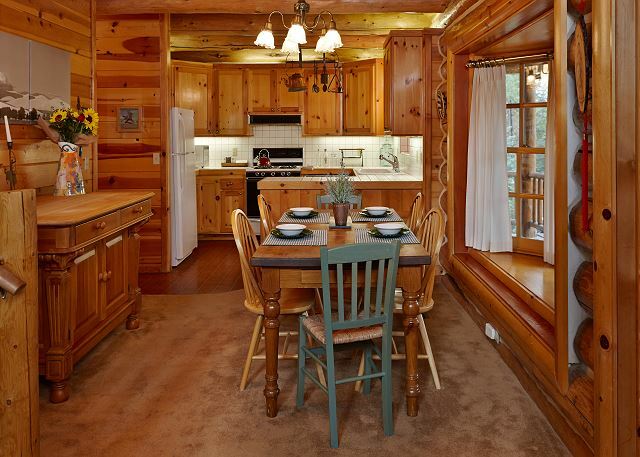 This is perhaps one of the nicest vacation rentals in Idyllwild. Checked into here after having a horrible experience with another house that was not fit to be rented, this lovely home was the complete opposite. Monica and Mike with New Spirit are the best!--would not rent from anyone else! Nice house in a great location - could use some curtains. Overall this was a nice house in a great location - nice views of the forest and the "rock" - we greatly enjoyed sitting in the hot tub and relaxing on the large porch. One thing that was not explicit in the description was that the 3rd bedroom was outside the main house, over the garage in the "treehouse." This was slightly inconvenient but not that big of a deal. More annoying was the fact that there were almost no curtains for the many large windows and skylights in the bedrooms. This made it difficult to sleep as our kids' bedtimes was before sundown and also the light woke them up around 5:30am. Otherwise the house was clean and spacious with great light and as described on the website. GREAT HOUSE! GREAT PROPERTY MANAGER! A stellar house and even more stellar Property Manager. Monica is the best as is her staff. The home felt like a home away from home. Will stay there again! The wife and I stayed at the Rock View Log Cabin with another couple in late April 2016 for a week. We were snowed in to our delight for a couple of days where we were forced (LOL) to lounge in front of a roaring fireplace adjacent to two picture windows looking out over the snow covered mountainside while we enjoyed delightful gastronomic snacks, savory appetizers, mignardises, sipping Champagne and listened to relaxing Zen tunes. The snow stopped, the ground thawed so we hiked around the country side to view the elegant rock cliffs and surrounding forest. The breath taking panoramic Eastern view from the porch allowed us to reflect on the indigenous wildlife and nature accompanied by an abundance of photographs. 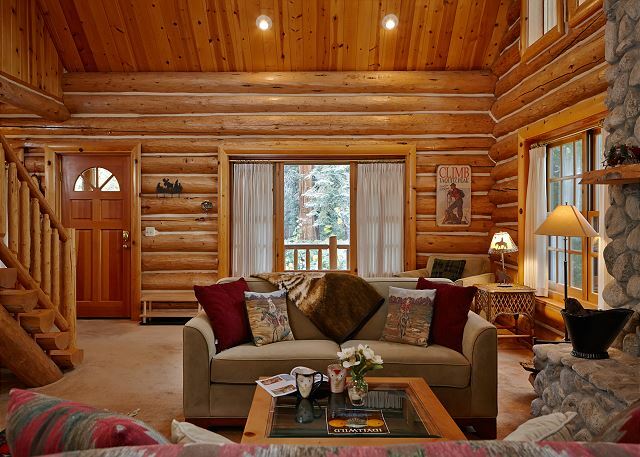 The spacious interior of the log cabin provided comfortable accommodations resulting in a relaxing and memorable visit. Sorry this reply is late but thank you so much for sharing memories of your stay with us. That is an awesome property to be at under snow conditions. Please know that for other awesome experiences and for futures please think about us for summertime stay in Lake Arrowhead where families just love to hang around the lake and swim-boat in a much more quiet setting than the ocean, Palm Desert and Palm Springs where golf ,tennis, nightlife, and shopping offer a little something for everyone and Temecula where wine country has grown to over 50 wineries and music and entertainment schedules flourish. We absolutely loved the Rock View cabin. I surprised my wife with a weekend out of town, I had heard about Idylwild and specifically the "Coyote Moon" cabin. I decided on the Rock View because it had the hot tub with it. It couldn't have been more perfect. You sometimes spend the entire vacation stressing one small detail, or wishing it were better. We didn't. Everything from the Christmas lights, fireplace with wood already there for you, privacy, hot tub, all just perfect. I stayed at a cabin in big bear last weekend, and this was so much better. The house was super clean, the hot tub was crystal clear, warm, easy to access even for one person, just a great place. I have been raving about it since we got back, thank you Niki and Monica for making me look awesome to my wonderful wife. You have truly made my Christmas!! !